This Literacy and Language Arts Task Card Bundle will save you time and money.Follow me to receive notice when FREE and paid products are added to my store.Even More Task Cards for Early Elementary Students at Rosa Mauer's Store Pin with me! Click here to view my Pinterest board. Anyone can join. 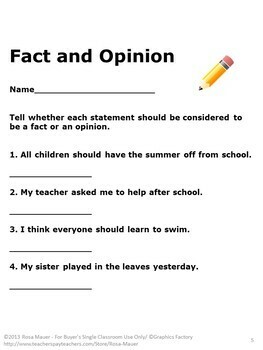 Fact and Opinion: Students are to determin whether each statement should be considered a fact or opinion. 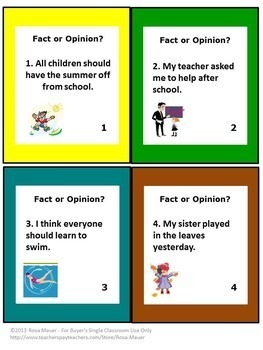 A response form for students and suggested answers for the teacher are included. Text for the 32 statements are provided in task card and worksheet formats. 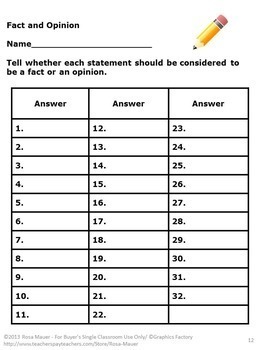 Additional worksheets for more practice are included. Here’s an additional Fact and Opinion product you might like. This one is all about food! 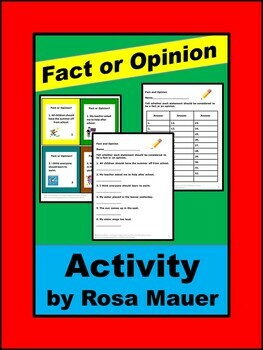 Visit my page to view products such as task cards and book units.